I've been picking up again with my old. beloved habit of going to the movies. I'm still not at my old pace (about twice a week or so), but I'm gaining track, which is all thanks to October being a fabulous month, full of releases I die to watch. 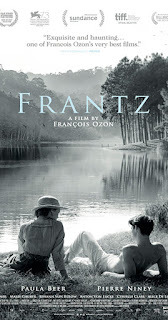 So far I've seen Blade Runner 2049, Wind River, Wish Upon, and yesterday I saw Franz, a movie by François Ozon, and which was part of a two week French Film Festival, held by one of the local movie chains. I intended to see another movie entirely, but then I saw this was being showed. so we (I was with a friend) went for that one. My friend is a younger lady who has taken French lessons at the Alliance Française, but as far as I know, she last year deserted the lessons. I can't tell you much about my own level of French, since I followed up to level 7 from the 9 back then, and then - upon a disagreement with the management - I left the classes and decided that I can very well keep my French up with yearly visits to Paris and a daily dose of Le Figaro and Le Monde. Honestly, so far, I've been able to defend myself. But that's beside the point here. Given that she and me allegedly speak (some) French, we decided also to go for Franz as a way to give our French some practice. And there were subtitles, just to make it safe. To our surprise - and my absolute delight - the movie was also heavily spoken in German, which instantly doubled the appeal for me and my chances to practice two of the languages where my knowledge is the weakest. Franz is a movie that deals with many important social and personal issues, such as prejudice, our tendency to hold into hurt and resentment, the need to project our pain and anger on others, even when they are undeserving of it, and also on the many subtleties of lies, deceptions and deceiving moves. At the core of the movie there is a central lie (I'm trying really hard not to spoil anything here), that once it gets revealed, two paths unfold: one living with the lie, and another living with the truth. What I like about this message is how it shows a case where the truth doesn't make you free, but enslaves you further, retrains you and ruins you, while the lie built upon it actually frees you and give you your life back. Throughout my life I've found that lies are not as poisonous as we are often told, and that there are lies, mweciful lies intended to protect others or to protect oneself. One can always, of course, argue on one side or the other, but there are certain cases at which - I believe - the truth would add nothing. However, not all lies are merciful or white lies, some are mean and others are senseless. It was interesting for me, how I watched this movie and the topic of lies came up in them, as I have gotten at a point with some friends whose compulsive need to lie about pretty much everything, is going out of hand. I really wonder how is it possible that I find myself with this type of people in my life over and over and over. People like this want to make me retire from the world and swear off friends forever. Then again, truth to be told, I see them more as frequent acquintances, and are not part of my close group of friends, which include exclusive and absolutely amazing people such as Shimmy Gin, Jules, Arjen, Tina. Sonja and Laura. One thing that really pisses me off about the liers currently in my life is that they seem to think that I'm stupid enough to believe their tall tales. Do they REALLY think I will really believe what they say? Or that anyone would? People seemingly able to remember and repeat entire conversations held in the past. And they always forget their own passwords. People portraying themselves as sensible, artistic souls and can only be seen and heard behave vulgary. People who claim to always put others first and don't even care when they trample over others, nor have any qualms about being abusive and opportunistic. People who claim to have magical powers, or suddenly declare themselves to be witches, mediums and yet can't even get right the use of chammomille. I have had many compulsively lying acquintances in the past, and the result is always the same: I walk away because their tall tales get to my nerves. Their tales always keep piling and piling up to the point where I don't see why should I waste my time with people with whom I clearly have nothing in common, if they feel such a need to feed me constantly with falsehoods. Useless, irrelevant, stupid lies. Two of my acquintances are quickly reaching this end.